This image has been buzzing around the web for the last few days: an imagined version of Grand Theft Auto set not just in Gotham City, but with a retro/classic style of Batman, Joker, Two-Face and all the rest. I've never played any GTA game, nor really want to, but I have to say I'd be curious what this would look like. I made the most of my last weekday of vacation by taking Nick to see The Dark Knight Rises; nothing like a Friday matinee to feel like an indulgence, (even under the grim shadow of the mass killings at a midnight screening in Colorado overnight). I liked the movie. I won't give away any spoilers, but Christopher Nolan has done a nice job of concluding the trilogy he wanted to make, while (I think) keeping fans happy. It also opens doors for DC and Legendary Pictures to continue with the seeds planted in this film, or reboot the whole story again. The scope of the film impressed me the most. The script was written long before the Occupy movement and the 1-per-cent tropes of us-vs-them that have played out in the news and pop culture, but they're embedded in the movie .. in addition to themes of terrorism, crime, overreaching laws, hero worship, idealism, corruption, loyalty, and on and on. It's all pretty ambitious. The set pieces are stunning, and I kept looking at the aerials of Gotham to figure out how Nolan's digital team pulled off creating a city that looks a lot like New York, but is not. To go by Nick's judgment, we'll be seeing a second time before the summer is out. If cats ran the universe .. I love the Batman and Robin Comic Generator, and have used it in the past; I nicked this one from my friend Andrew's Facebook feed this morning. And I saw the original, too, and I do not remember it fondly. The alternative poster for Batman Returns was spotted here. ... and a bat, too. This is today's T-shirt design from RIPT. Seen through Tumblr via Sinapses. 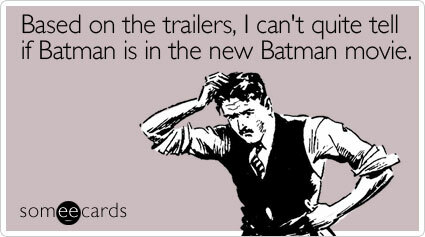 This made me cowl. I mean, howl. As seen here. No need to do bat eyes, Batman. As seen here. "The Bat," from Bearskinrug. Brilliant. Batman: The Return of Bruce Wayne is the latest rebooting of the bat-franchise ... this time, evidently, with a time-shifting story arc. (Um ... okay.) 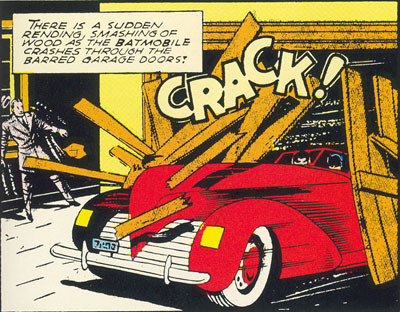 Above is a six-panel collection which shows Batman moving through time; click on the image to get a better look. If you look closely, you can see the bat logo in there. The series launches next month. In the meantime, here's a closer look at the first cover. Just learned about the Batman and Robin Comic Generator. I put in a topic of some debate here in St. John's, about a proposal to build an office tower at a key location in the downtown. Depending, of course. Click here for a Chris Brown item that aired on The National this week, on a theory about how anyone ... with hard work and dedication ... can become a crimefighter. We use a merit-demerit point system in the house, to keep the eight-year-old boy moving in the right direction. If he does something well (especially without prompts), he earns a point; naughty behaviour takes a point away. It's worked well, with the kid earning points for a variety of things. His current objective: A Lego Batman game. By coincidence, I came across the above - which, believe it or not, is a cake made to celebrate the game's recent launch. The other day, I took my son to a matinee of Journey to the Centre of the Earth. (He liked it; I had a chuckle, mainly over the 3D stuntiness of it all.) At the popcorn stand, I was surprised to see a mom with a small boy of about three or four, loading up with snacks tied into the Batman promotion. 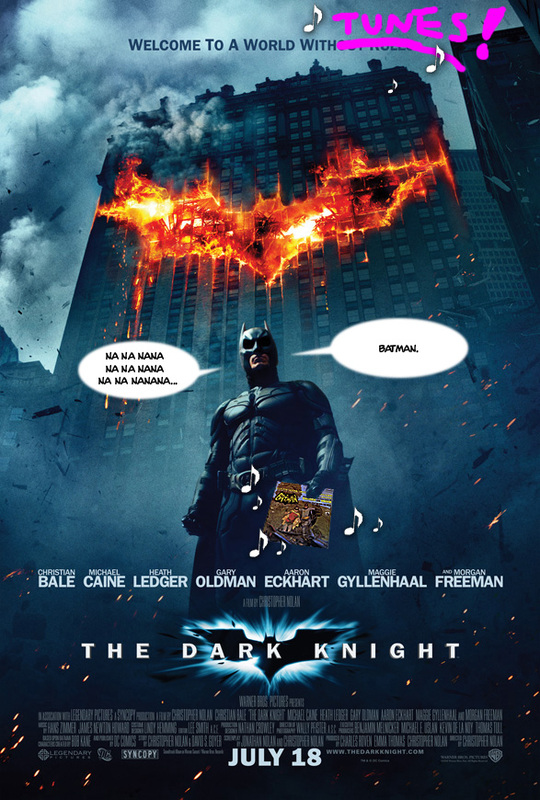 And yup, into the Dark Knight they went. I hadn't seen The Dark Knight by that point, but I had already been steered clear by parental warnings ... including one direct note from my friend Mike, who said, "Do NOT take Nicholas to it." I saw the movie, on my own, later on, and have to agree. I'm not surprised parents would think the film might be appropriate: the stores are filled with child-targeting toys, products and spinoffs. But Christopher Nolan's film is aimed very much at adults, teenagers and mature children. The choice is up to parents, but I'd stick to the more kid-friendly versions of the Batman story for younger kids. As seen on someecards.com, the e-cards for "when you care enough to hit send," this example seems appropriate for some movie fans this summer. A detail of an image on Dial B for Blog, for a piece that connects the darker movie Batman with the, well, sunnier TV version's theme music. I like the Damn Interesting website, which appeals to the curious. Here's the T-shirt to match, with a Batman-style (well, kind of) logo in the centre. As seen here. 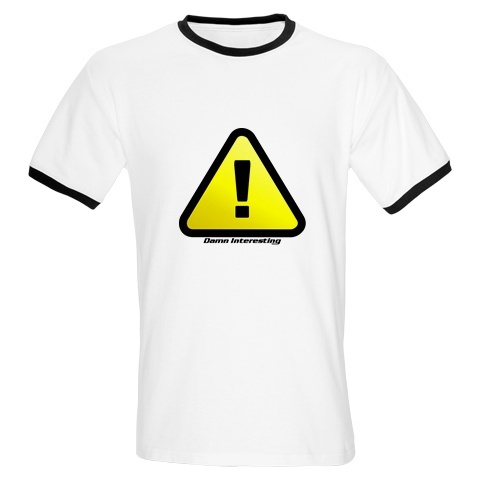 Click on the tag below to see other T-shirts rounded up here. 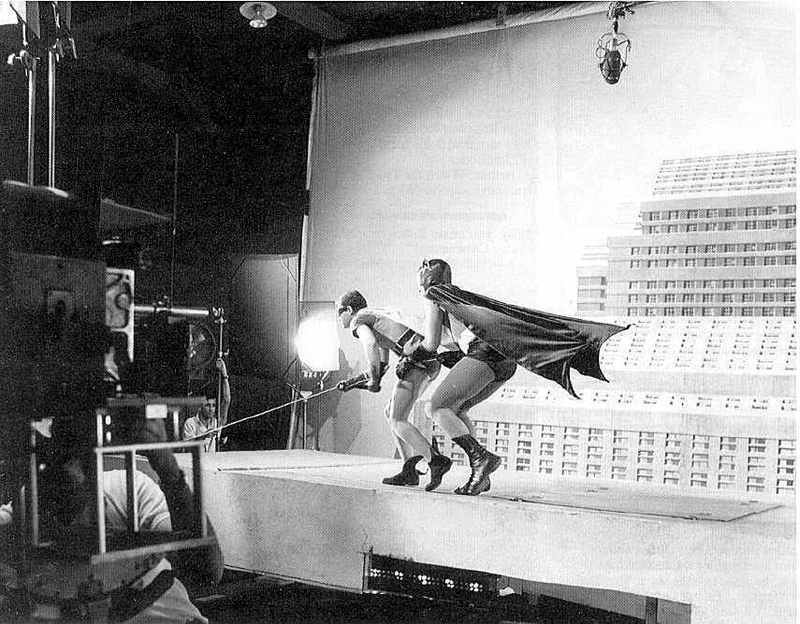 What, you thought Adam West et al. on Batman risked life and limb to climb skyscrapers? Wicked. Anyone who's paid more than a passing glance to Batman comic books, TV shows and movies knows that the Batmobile has had more than passing upgrade or two over the years. (The above is the first one ever, by the way.) The History of the Batmobile site has a comprehensive survey, although its organization could stand some tidying up. 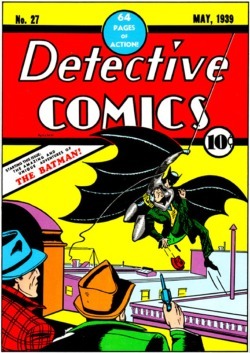 On May 27, 1939, the 27th issue of Detective Comics was published, introducing Batman. The legend has held pretty tight ever since. 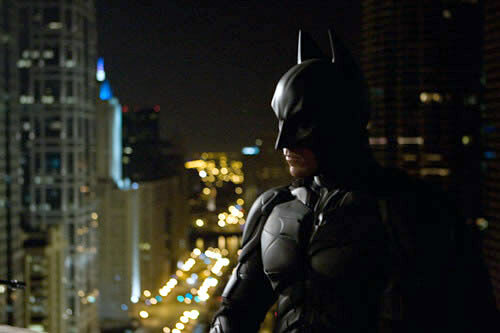 I liked that in Batman Begins, the production design kept a retro feel while retelling Bruce Wayne's Gotham story.